To achieve anything in life age does not matter and it just remains as a number when someone strongly believes in her/himself. Pramila V Puranikmath, is one such strong believer whose optimism and faith lead her to be an entrepreneur at the age of 50 years. Natal of Kolhapur, Maharashtra and settled in Hubballi. Pramila was unaware of the outer competitive world until her Doctor husband passed away due to cardiac arrest. Since she was from a well-off and traditional family she could only study till II PUC and never even felt the need for higher education or completing till graduation. After marriage Pramila came down to Hubballi and started living with her husband, who was a general practitioner. The happy couples were blessed with two daughters. When all was going good, Pramila and her daughters were shattered losing the sole breadwinner of the family. The sudden demise of her husband had made Pramila be dependent on her brothers-in-laws and brothers to run the family which hurt her self-respect. Then with great courage and support of her family, she thought of doing something on her own to run the family. Her brother gave a piece of advice to start a small business with food products. Considering the brother’s advice, Pramila initiated to introduce Bhadang (puffed rice chivda) within her friend circle. One fine day she got to know about Navodyami Sante – a platform for micro & small entrepreneurs to exhibit and sell their products. At Sante she met a team member of Navodyami and imbibes the skills of entrepreneurship. She became a member of Navodyami. 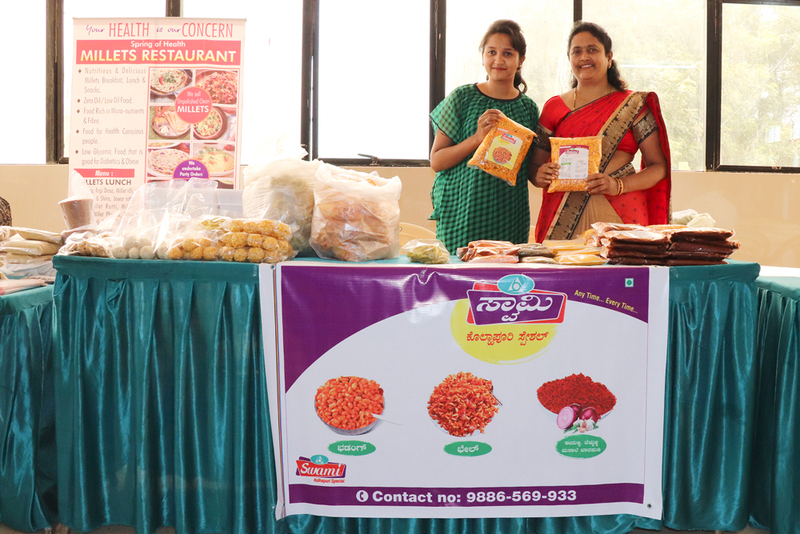 “I started my entrepreneur journey with the popular snack of Maharastra called Bhadang, which my brother use to send me from Kholapur and initially it was between 20 – 30 kgs business, but now because of Navodyami Sante my food product got a huge response and people started liking it so much that orders are pouring in for the product. I just participated in two Navodyami Sante, and people started recognizing me and my product. Now, I manage to sell about 100 to 150 kgs on an average in a fortnight. With Bhadang a unique masala chilli powder (Kandalussunchatni), turmeric powder, Goda masala (use to prepare vegetable curries and Pulav) is added in the list of our food business” says Pramila. 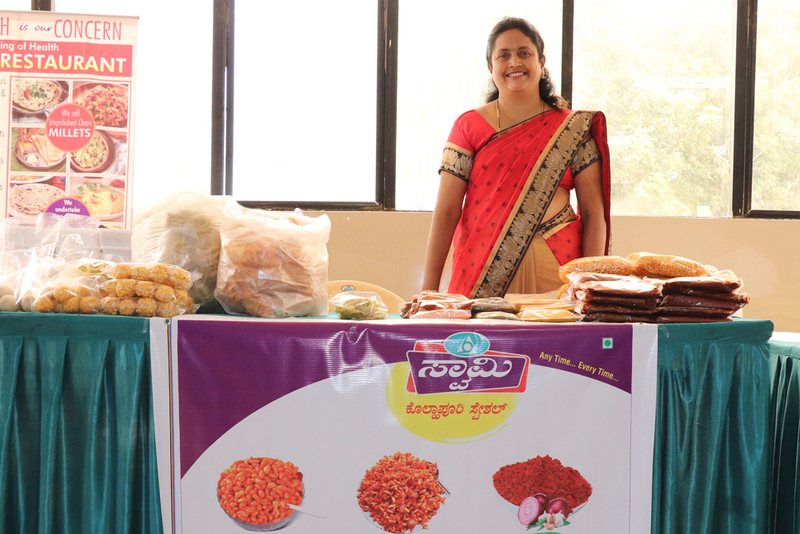 “Recently, I grabbed a contract to serve the Bhadang as a snack to the Jain Heritage International School Hebbal, Bangalore and the response was really good. Apart from this, with the Bhadang, I am trying bhale and other varieties of snacks” adds the confident Pramila. The way Navodyami team has co-operated, fetched all the needed support and trained me to be an entrepreneur, I do not think so no other organization could able to do this needful. Now, I do not feel like I am a budding entrepreneur instead I feel I am confident and can train and support other women like me who need timely support at the most crucial phase of their life. Pramila with her younger daughter posing happily with her products at Navodyami Sante. Initially, I Started with Rs. 10,000 capital now the turnover is 30,000-35,000 (Per month). And when it comes to profit Pramila can able get 60 % out of her turnover. My immediate target is to reach 50,000 in few months and the future plans are to scale up this business and make it as a brand and start the franchise in different cities, try out different flavors and many more. Since it is a healthy snack, it is suitable to all age groups adds Pramila.